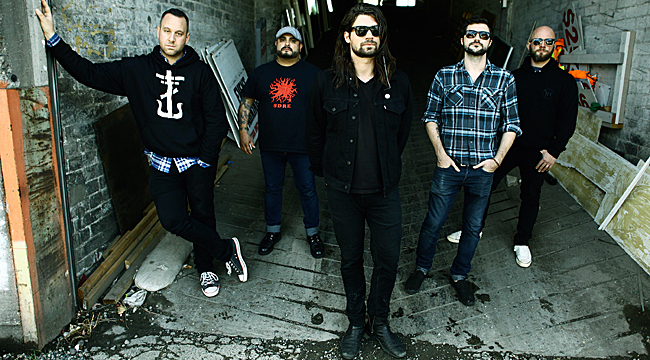 The Long Island-based rock band Taking Back Sunday recently reissued Happiness Is: The Complete Recordings. The boxset features the band’s original 2014 record along with rare and unreleased tracks. The songs are all spread out on eight 7-inch vinyl records with a collectible, signed art card. The band also embarked on a headlining North American run with letlive and The Menzingers. Singer-guitarist John Nolan phoned from his Charlotte home to discuss the release and tour. Talk about re-releasing Happiness Is: The Complete Recordings? We are releasing a deluxe version of the album. It has three B-sides that were recorded with the other songs but not released. There are always a few acoustic versions. The package has 7-inches for every song on the record. It’s a big box set. What did you want to put it out this way? We’re all vinyl collectors and we like the limited edition boxed sets. We thought it would be cool to put out the kind of thing that we would like to have as fans ourselves. When you were growing up was there still lots of vinyl? For me, it was not really a thing that I did. I’m sure there were always people who really stuck with vinyl. When I was in high school, CDs were really becoming the big thing. I actually grew up listening to everything on tape and fast-forwarding and rewinding. It was about 8 or 9 years ago that I started collecting vinyl. Things were becoming more about iPods and digital music and that’s part of what drew me to vinyl. I wanted to hang on to the physical part. What I do a lot now is that if I want an older record, something that’s classic from the ‘60s or ‘70s, I’ll get it used. I do a lot of that. Talk about the band’s formation. What was the music scene in Long Island like in 1999? The scene had existed and been thriving for a very long time before we came along. There was a decade of music and bands that had made names for themselves locally. A unique sound had developed because of that. Bands had influenced each other. There was a definite sound that influenced Taking Back Sunday. We came along when that sound was starting to gain more attention all over the country. We ended up in the right time and place. We spent three years playing Long Island and maybe New Jersey and sometimes Connecticut. They were mostly afternoon shows in a small bar or a VFW Hall. It doesn’t seem like these scenes sprout up like they used to. I don’t really know. I’m not sure if they don’t sprout up or if I’m older and out of touch and wouldn’t be aware of it. You left the band for a while but then returned in 2010. What was it like to go back to the group after a hiatus? When I came back we got together for the first time outside of El Paso, Texas. It was this really remote place on a giant pecan farm. We had our own house to stay in and studio. We spent a lot of time reconnecting and working on music casually. That was a pretty amazing experience. It had been seven or eight years since we had been in a room together. Then, the whole process of recording and writing with them was a big learning experience. It was a very different thing than it was when I had left in terms of the level of professionalism and the amount of time and work that went into songs into the studio. Demoing songs and reworking them — that stuff didn’t exist as an option when I first was in the band. You recorded Happiness Is in the summer of 2013. What were the recording sessions like? We did it in two separate sessions. We did the first half in Michigan. Mark Hudson who was our sound guy owns a house outside of Detroit. We were there for two months and recorded half of it there. The other half was done off Long Island with Mike Sapone, a producer we worked with on some of our first recordings. We’ve known him for a long time. Both sessions went really great. It was nice because we had worked with both people for years and years. It made for a more comfortable environment working with someone new in a new studio or with someone you only worked with here and there. It all felt organic and natural. What were you going for sonically? I think we felt that the self-titled album wasn’t as rough around the edges as we would have wanted it to be. We love the way it sounded but naturally our sound is a little less polished. That was one thing we had in mind. Another thing, in general, is that we wanted to be open to all kinds of ideas. We didn’t want to limit ourselves because something didn’t sound like Taking Back Sunday. We wanted to go with anything anyone had, try it out and not limit ourselves. Only in theory. Everyone has ideas that we work on individually. Once touring winds down, we get together as a group and bring those ideas together. We haven’t gotten to that point yet. I’m not quite sure what it is. I think we appreciate each other more than we used to. We appreciate what the band has achieved. In the past, we have taken things for granted, whether it was each other or the status of the band. We’re a little more grateful and aware of how lucky we are.